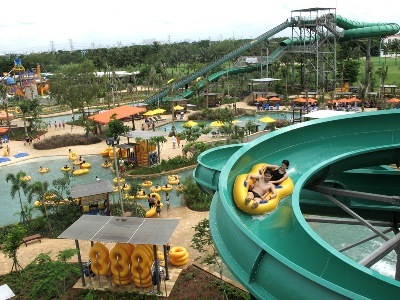 Waterbom Jakarta is the leading waterpark and recreation destination in Jakarta. Located at Pantai Indah Kapuk in North Jakarta, next to the Damai Indah Golf Course, it covers an area of about 35,000 m2 with a parking area that can accommodate 1,000 cars. It has a direct toll road access and only 10 minutes to the airport and to the heart of the city as well. Waterbom needed a truly integrated touch screen POS system which fully supports RFID technology in a mobile cashless environment. The POS system was required to integrate all the RFID equipment in the park and fulfill its functions as an entrance system, retail POS, food court POS, and customer relation management system. Mobile POS systems were needed for orders from the food court. The newest and leading water park in Indonesia, Waterbom needed a complete RFID end to end solution for their daily operations. All the different departments in Waterbom had to be fully integrated with one another; Entrance system, Food outlets, Merchandise stores, turnstile, lockers, customer relation management system, and inventory. Raptor had a complete solution which required minimal customizations. They also required the ability to report and control information from every department with consolidated and individual reports. The water park required a total of 18 Raptor Touch screen POS systems with RFID readers, and 3 mobile Raptor POS systems with RFID readers. A total of 28 POS printers were used. Waterbom is 802.11g Wi-Fi enabled, this enabled the mobile Raptor POS systems to take orders anywhere in the park. This improved system allows the captains to stay around the customers to better address their needs. Once the orders are taken, the payment is directly deducted from the customers’ splash bands, and the orders are automatically sent to the respective stores. The runners will deliver the ordered items directly to the customers, this saves a lot of time for the captains who would otherwise have to pick the food and drinks up personally. With the captain always near the customers, you can be sure all orders and requests are followed up, thus ensuring high customers’ satisfaction. The latest buzz in waterpark payment applications, Raptor’s Cashless POS (point-of-sale) Solution is fully integrated consisting of RFID wristbands and readers at POS stations throughout the park. Guests at Waterbom can easily load money onto their “Splash band” RFID wristbands using cash, credit, or debit at any POS terminal. The process of loading money onto the wristbands is simple and fast. Guests can go to any POS locations throughout the park to load money. Any data, particularly personal data, stored on the RFID chip can be encrypted, preventing unauthorized users from reading the data which can only be read by RFID readers programmed specifically for a venue’s application. Having to work with different vendors for RFID integration, the industry leading MiFare standard was chosen. The RFID tags were provided by Sokymat, a leading RFID manufacturer, which was waterproof and could withstand the harshness of salt water. Both guests and venue operators benefit from the use of RFID enabled technology for cashless payment. Guests no longer have to carry cash, a wallet, or a purse while at the waterpark. The wristbands are not vulnerable to damage caused by pool chemicals, water, sunlight, or stretching. The system’s ease-of-use, speed, and convenience are key advantages for guests, creating shorter lines and faster transactions at all POS locations. “Guests’ experience and satisfaction are enhanced using Raptor’s cashless payment technologies allowing them to focus more time on having fun together with friends and family,” says Agus. Park operators can benefit from increased per cap spending and breakage – unspent credit left on wristbands after guests leave the park—which in turn helps increase overall sales revenue. The system can also gather customer and purchase data which is valuable for targeted marketing and promotional purposes. It might be expected that purchases with a wristband would be easier for the park visitor than cash or credit card, and thus visitors make higher levels of purchases. Parks might include the “free” use of the identification device for annual pass holders, or for those groups that place a high credit amount on each wristband. From a marketing point of view, attendance should rise. Though cashless purchasing are benefits to the park visitor, the real benefit to the park operator is demographics. The park now has the ability to collect information for each wearer, including a complete record of every ride or shop or park bench visited during the day. This information will create a completely new awareness for park marketing teams and park designers. The bottom line is simple; park visitation will rise and new demographics will allow the park operator to provide better services today and for parks of the future.